There are two main journals dedicated to occupational health: psychology and management which serve our interests: Work & Stress and the Journal of Occupational Health Psychology. Work & Stress is an international, multidisciplinary quarterly presenting peer-reviewed papers (research, theory and policy focused) concerned with the psychological, social and organizational aspects of occupational and environmental health and health and safety management. Traditionally, it has had a particular interest in the relationships among work, stress and health. The journal is published by Taylor & Francis in association with the European Academy of Occupational Health Psychology. I was the Founding and Managing Editor of the journal until the end of 2013. The new Editor is Professor Toon Taris (Utrecht) while Mary Tisserand remains its Editorial Adviser. The Journal of Occupational Health Psychology is also an international, multidisciplinary quarterly. It publishes research, theory and policy papers concerned with “the application of psychology to improving the quality of working life and to protecting and promoting the safety, health and wellbeing of workers”. The journal is published by the American Psychological Association (APA) and its Editor is Joseph J Hurrell. Other journals of interest include: the Scandinavian Journal of Work Environment & Health, International Journal of Workplace Health Management, Safety Science and Occupational Medicine. The International Journal of Workplace Health Management considers workplace health from the wider public health perspective and from the perspective of the individual organization. Workplace health and related issues are discussed within the framework of individual health, workplace culture and physical work issues which the journal sees as including health and safety legislation and occupational health, policy and compliance. The journal is published by Emerald and the Editor-in-Chief is Dr Lydia Makrides (Creative Wellness Solutions, Canada). I am on the Editorial Advisory Board. 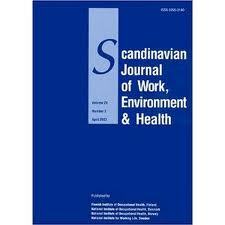 The Scandinavian Journal of Work Environment & Health is an international peer reviewed publication in occupational safety and health. It was formed from the fusion of two journals in 1975: Work-Environment-Health and Nordisk Hygienisk Tidskrift. It is published in English and began publication on 1 January 1975. It is published by the Finnish Institute of Occupational Health, the Danish National Research Centre for the Working Environment, and the Norwegian National Institute of Occupational Health. The Editor is Professor Mikko Harma (Finnish Institute of Occupational Health, Finland). The journal has an Impact Factor (2010) of 3.540 and is in the top 18% of journals in public, environment and occupational health (95). ISSN: 1795-990X. More information at: http://www.sjweh.fi/index.php. Safety Science is an international journal presenting research in the science and technology of human safety. It extends from safety of people at work to other spheres, such as transport, leisure and home, as well as every other field of man’s hazardous activities. The Editor is Dr Katherine Mearns (Aberdeen). Occupational Medicine is an international peer-reviewed journal providing information for the promotion of workplace health and safety. Topics covered include work-related injury and illness, accident and illness prevention, health promotion, occupational disease, health education, the establishment and implementation of health and safety standards, monitoring of the work environment, and the management of recognised hazards. The Editor is Dr John Hobson (SOM, London). The Archives of Environmental & Occupational Health was founded in 1919 as the Journal of Industrial Hygiene, and is best known as the Archives of Environmental Health. It presents research in the fields of environmental health, including epidemiology, toxicology, risk science and biochemistry. The Editor is: Dr Tee Guidotti (Washington DC). Journal of Workplace Behavioural Health, formerly Employee Assistance Quarterly, presents innovative research, applied theory, and practical information to keep workplace human service administrators, counsellors, and consultants up to date on the latest developments in the field of work-related and personal issues including workplace and family wellness, employee benefits, and organizational development. The Editor is: Dr R Paul Maiden (University of Southern California).